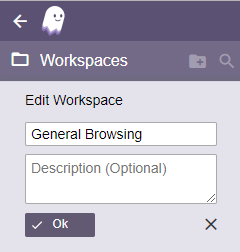 When you first launch Ghost Browser you'll notice that you already have one Workspace in your list called, General Browsing. 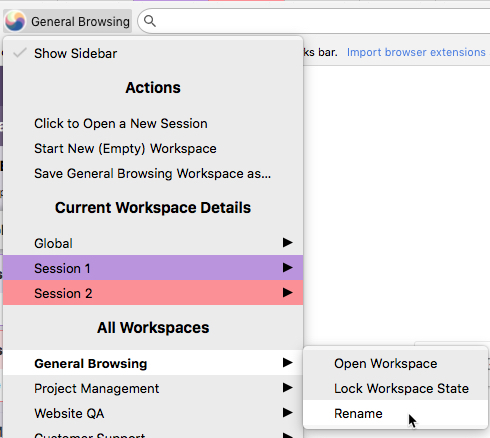 We created this Workspace to help you understand how Workspaces work, but also so that you would have a space to use for "free style" browsing like you would in any other browser. 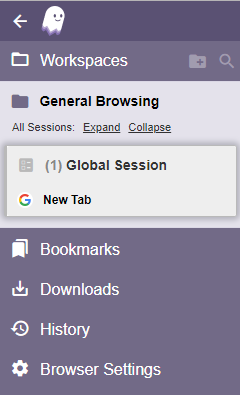 The same great Session and tab management features are available in the General Browsing Workspace as well, but you can think of this as the place where web browsing happens. We encourage you to set up specific Workspaces for focused work in order to help you be more productive. The General Browsing Workspace can be Renamed, but it can not be Completed or Deleted. You can reorder it in your Workspace list to appear in any position you want by dragging an dropping it into the desired position in your Workspace list. I use my General Browsing Workspace to check my personal email and get a quick run-down on the news. Then I jump into my focused Workspaces one-by-one to work through the daily tasks I need to accomplish. Click the Ghost Menu button to the left of the address bar. Hover over the General Browsing Workspace name. 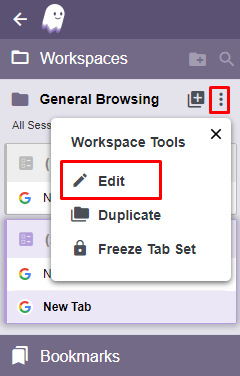 Select Rename from the sub-menu.